Joko laughed at my patent nervousness as he lead me into the traditional Zulu gear stalls at Dalton Hostel – in Durban, South Africa. Animal skins lay around willy-nilly as did drums, umbadada (car tyre sandals) and empty Juba cartons. There was a lot of movement of people entering and leaving the hostel. A number of drunken men lazed in the sun and indolently observed as this big white man entered their own almost tribal domain. One of them staggered to his feet and aggressively expelling his boozy breath, he demanded to know, “Ufunani umlungu!? (What do you want, white man?). I responded with equal power, “Ufunani umuntu! ?” (What do you want Zulu person!?). The inactive audience suddenly burst into surprised and delighted fits of laughter. My interrogator laughed meekly and stumbled towards his friends. As we entered the dark shops the crafters’ art became apparent. Magnificent Zulu shields, beads, headgear and other finely detailed items of traditional imivunulo (warriors attire) were on display. Joko greeted everyone, “Sawubona lekhaya! Ngiyahamba no uMthimkhulu!”, and thus was I introduced by my Zulu name, to a chorus of disbelief from the shop owners. It was mid-year 1993 – a year before South Africa’s independence from the Apartheid government. Prejudice was deep and attitudes ranged from hate to fear in many previously isolated race groups. Joko – a jovial Zulu man – and I had met a few days earlier at the Pick and Shovel restaurant. I told him of my desire to purchase a traditional Zulu outfit. “No problem.” he said. “We just need to go to Dalton.” “Do you mean the hostel, where there is so much violence.” I asked. He said, “Don’t worry you will be safe, I am taking you.” And here we were. There was much laughter at my size as we moved from shop to shop. Each one selling a different component. Here shields and there amabeshu (hides shaped to cover behinds). Each craftsperson was skilled in the manufacture of a certain part of the imivunulo. There were fighting sticks, walking sticks, spears and knock down sticks. Head, chest, elbow, leg and waist gear hung from the walls and ceilings. A few men lay about the place, sleeping off hangovers. Their neighbours sold on their behalf. Every now and again a sleeper’s eye would open. He would grunt his satisfaction and drift back into dreamland. Slowly compatible pieces were gathered to form my very own outfit. A black and white cowskin shield contrasted well with the light tan impala skin ibeshu that hung over my behind. The beautiful sewn and twisted izinjobo covered the sides of my legs up to the isinene, which covered the front. There was much laughter when the enthralled shopkeepers showed me a straw thimble, known as iqoyi. This they giggled, would save any man from embarrassment…. Inkosi (Chief) Bhekisisa Bhengu, had become a friend in the Valley of a Thousand Hills, through my peace making and rural development work with the Natal Canoe Union. He was young and very wise, an interesting mixture of modern and traditional. He has travelled to Washington DC – USA and Zimbabwe and is well educated in development and local government issues. He longed for development in his area and was very involved in the traditional respect system. I drove out to see him, with my new imivunulo in my car. He was as impressed as I was delighted and said, “You must wear this on Saturday at Inkosi Gwala’s wedding.” A thrill of fear and excitement ran through me. It was a year before the first free elections and KwaZulu Natal was racked with political violence. Putting aside my natural trepidation, I agreed to meet him at 10 am on the day of the wedding. My niece Jean, and I drove down into the valley and arrived at his Emshazi home, across the road from the tribal court. He seemed surprised to see me so early and we hung around and chatted. Every so often he would look at his watch and shake his head and say, “Hayi Bhungane – I don’t know where these people are”. I think he was just trying to settle my western rush to do things, so I relaxed into the day and whatever it was to bring. After a while Mrs Bhengu fed us. Then we waited and watched the goats and chickens wander around his yard. An old man drove his old van into the yard and opened up the bonnet. We then had a conversation on all things mechanical. Around about 1.30pm Inkosi Bhengu decided it was time. “When is the wedding?” I asked. “It is on now,” he said, “in fact it has been going on all day. Let us get dressed.”, he said. He called his young son in to help. We, two men from two different worlds, prepared to culturally meet. I am sure my ancestors in Ireland and Scotland were rolling in their graves, as I learnt how to put on my skins. I learnt how to hold my shield and how a warrior should walk and stand. Little bits of string held each component to my body and I felt very exposed in my underpants. 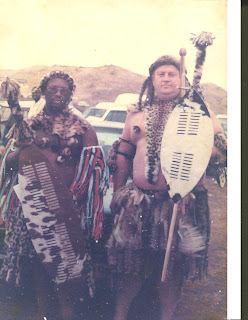 Inkosi Bhengu looked splendid in his imitation leopard skins and I stood proud on my car-tyre sandals, as my unclad parts shone brightly in the African sun. The journey was about to begin. We drove down the hill to Shabalala’s store and he then began to dress. When he was ready, we moved onto Mathowuli’s place. His name comes from the fact that he always has a towel wrapped around his head, like a turban. Up the hill, on steeply angled red clay roads, to another Bhengu. There was much shouting across the lands from homestead to homestead. The Inkosi was going to the wedding and he was with an umlungu in skins! An incredible excitement seem to hold the valley in its grip. The procession gathered people and cars and we met up with Induna Cele who had an impressive python’s skin for his ‘beshu. The young maidens were now gathering and bounced down the hills towards us. They blew dance whistles, beat on drums and ululated as they jumped into the cars. “Wozani,” the Inkosi called inviting them into his car. “Thank you Inkosi,” they said. “We will go with him.” Girls piled into my car and somehow the Inkosi ended up with me, as well. The Inkosi and I led his people down the dusty roads, alongside the beautiful dam, to eMaphephethweni. The young maidens still shouted, whistled and ululated with delight to all who would listen! “Slow down, Bhungane.” said the Inkosi as I hit 40kms per hour. “There is no rush”. At 2.30 pm we cruised into the area. The bride and groom were in traditional Christian outfits as they had just completed the church wedding. Little people in beautiful suits and dresses wandered around the church. Car alarms had been re-wired to run continuously to let the people know that their Inkosi was getting married! Our own group wound on past the church to the tribal court. At which point my confidence took a temporary and almost traumatic beating. As I stepped from the car, the excited people began to ululate and shout. Many ran toward me. Even little old ladies raised their umbrellas and advanced upon me in a threatening and laughingly aggressive way. I later found out that it was an expression of joy and fun. The Inkosi walked coolly amongst the people with a tiny smile upon his face. I just smiled, greeted everybody and ducked the “attacking” matriarchs. And stuck like glue to the Inkosi. My petrified niece was as close to me! We were lead up the hill towards the homestead. Inkosi Bhengu’s traditionally-clad followers gathered and walked at our sides in a protective and energised squad. We were taken to the VIP hut where we were treated to Zulu hospitality. Jean was led away to be with the women, and I to the amabhuto (the Inkosi’s regiment.). The AmaNgcolosi gathered around their Chief and began to beat their sticks against their shields. A powerful rhythmic noise filled the rolling hills. Young men would suddenly leap out, dance and spin away, beating their shields and presenting a fearful face to the gathering crowds. Ladies, young and old, began to dance and ululate near the group. Dance whistles blew, drums were beaten and horns were sounded. As the warriors’s passion grew d they continued to “‘giya” with more energy, to the obvious delight of the wedding guests. We marched down the hill towards the kraal. Singing songs and beating our shields. I was still a little fearful but was becoming more a warrior than a man from the city. The Inkosi showed me how to hold my shield again. I was at one with Africa for perhaps the first time in my life. The wedding processes went by in a blur. A delighted Inkosi Gwala danced for his bride. She was now dressed in her traditional gear and he in his imivunulo. Gifts were traded back and forth and families were united through the bride and groom. The young groom “ ‘giya’d” for his people. He danced and showed his masculinity for the appreciative guests to see. He marched with his amabhuto and I ended up in the cattle kraal with them. The names of his ancestors were called by his praise singer and respect for his line was shown. Later we ate and shared Zulu beer. It is milky in colour and far less alcoholic than western beers. We sat in a huge crowded hut, as the amabhuto sang and danced. The place vibrated and reverberated with energy. Huge cracks opened in the concrete floor from their stamping feet. Globes of sweat ran down their glistening and muscular bodies. The songs were unlike anything that I had ever heard. It was an amazing place to be, in an amazing country, amongst an incredible people. The sun had set long before we left. Our car lights pierced the darkness of an electricity free Umgeni valley. We reached home after 9 that night. A roadside newspaper seller was shocked to see this “white” Zulu reach out to buy the early edition of the Sunday paper. With me forever will be other special moments. The image of the amabhutos running, as one, from the surrounding homesteads. The view into the valley of a thousand hills. The smells of the skins. The man who said I should not wear anything beneath my Zulu “kilt”. The maidens running down the hill and Bhengu and his vaseline. The Induna in his python suit. The energy, fear and the acceptance. Brian V Moore © 24 11 2002. Durban – South Africa. Previous PostThe Celebrating Humanity Experience. The best ever Diversity Training!Next PostAll Victims – A story of deep-rooted prejudice.